...All of that got me to thinking that the It Takes a Nation..., The Chronic, and The Low End Theory albums were all game changers in terms of the hip hop production landscape. Then I started thinking about what recent album really served to change the production landscape, when I concluded that the album had to be none other than Dilla's Donuts. Though all four albums have a very different sound, I was amazed how well the four album blended together. 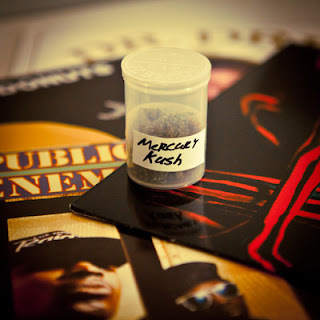 As many of you know, the whole idea of the Kush series is a takeoff from Dre's Chronic album. During the recording of The Chronic, "chronic" became a term in the studio that was synonymous with some "next level" ish. Borrowing from that train of thought, I created the Kush series for mixes that sound a little "different." In the spirit of the "kush," I concluded that mixing together four albums that altered the production paradigm would be an appropriate return to the Kush series. Originally, the mix was going to be titled It Takes the Chronic and Low End Donuts to Hold Us Back, but I decided that Mercury Kush was better. Hope you all enjoy the mix."